Join us for a night of thought, music and celebration. Jac Min writes films and tinkers with motion design. His obsessive curiosity has led him to toy incessantly with the moving image mediums. As a result, he is a writer-director of commercials, short films, promos and music videos. He believes in crafting fresh, visceral experiences around tight, interwoven narratives. ANTZ has managed to create an interesting juxtapozed mash of contemporary urban styles with traditional Chinese visuals and influences. It is a style which makes heavy references to Chinese culture; from mythology to dialect and identity. Apart from being a full time professional art director, ANTZ is also the co- founder of the design collective The Geeksigners. Along with fellow artist, CLOGTWO, SKLO, SHEEP and ZERO, ANTZ is part of RSCLS, a collaborative approach of styles, ideas and creative banter. Rachelle Su aka BAY+B (pronounced “bay bee”) is an idiosyncratic character with an obsession for structures. Her fascination with assembling individual parts to form a complex whole has led her to DJ-ing while her musical influences are typically cross-genre, comprising sounds robust in song arrangement. House, boogie, disco, funk and soul make up her palette of sounds. BAY+B has since played at notable venues and festivals. Jane Koh is a practicing Artist-Curator. 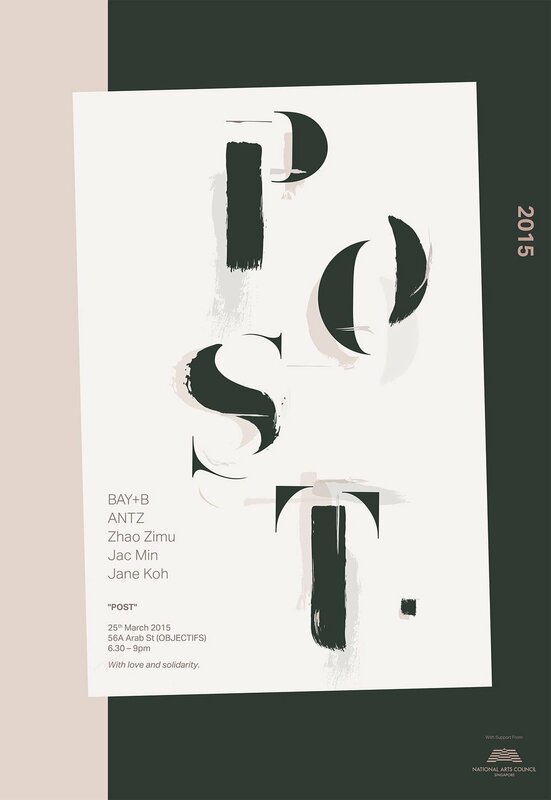 Her love for story-telling has compelled her to finally embark on producing a publication for POST (25/03/15). Fresh from a residency program in Paris (National Art Council- Dena Foundation), her dreams of seeing people come together in love and solidarity is realized through her curatorial undertakings. Her curatorial projects and visual works have been shown internationally. Zhao Zimu is a child of globalization. Born in China, he grew into becoming a Singaporean and was later influenced by an exchange program in Germany. Currently an animation major at Nanyang Technological University (School of Art,Design and Media), he is never limited by medium nor imagination. His works have been featured in the likes of NYLON and Land Transport Authority. An avid lover of cats, he enjoys petting one to the tunes of chill-hop or Ghibli Studio.